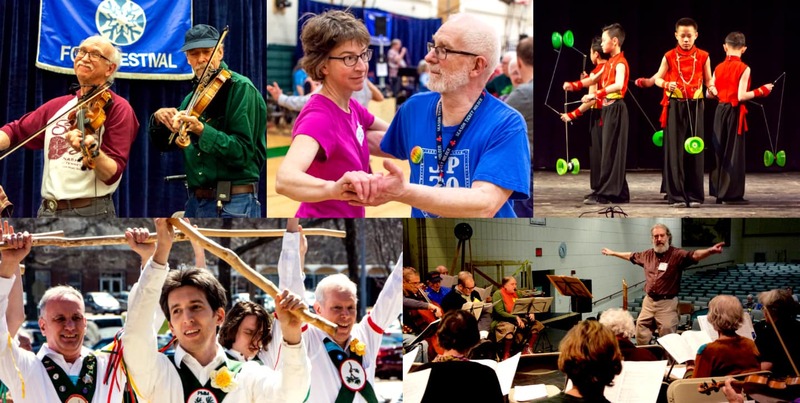 The New England Folk Festival, widely known by the name NEFFA, is an annual folk festival that blends dance, music, crafts, and food from many places and cultures. This year is our 75th annual Festival and we hope that you will join us! The Festival is run by the New England Folk Festival Association, a cultural and educational, volunteer-run, non-profit organization. The talent of our performers is also provided on a volunteer-basis. Where: Mansfield, Mass., Middle and High Schools. Directions are available here. Admission: 2019 Ticket prices here. Happy 75th Birthday NEFFA!- No price increase this year. There will be no advance-sale festival tickets this year. Please bring cash or check. We are also arranging for ATMs in the High School lobby in case you are short on cash. Don't worry! We don't sell out! Schedules: Festival grids for 2019 are available here. 2019 Medley schedule - because you asked! NEFFA contra Medleys are at 9pm Friday, 5pm Saturday, and 12:30pm Sunday. Full schedule to be posted in February. Lodging: Information for 2019 is available here. Program Book: Program Book: Our 2019 printed program book. Lose something at the Festival? Fill out this form. Contact NEFFA for answers to other questions. To reach the Festival site in an emergency, call 617-299-1590. Tentative Date for 2020 Festival is April 24-26, 2020. The Festival attracts approximately 3,500 attendees from all over the country and overseas and features upwards of 1,000 performers. NEFFA is unique because of the participatory nature of the events. Not only are there concerts and performances, but there are also opportunities for people of all ages and backgrounds to engage with music, dance, and folk arts culture. Music: There is music everywhere! You will find jam sessions in the halls, instrument workshops, group singing, and performances of folk music throughout the Festival…turn the corner and music greets your ears. Bring your instruments; free instrument checking is provided (but no overnight storage). Practice rooms in the Middle School will be available on a sign-up basis for rehearsals and jam sessions. Participatory Dance: The Festival is known for its varied social dance program, which includes: A lot of contra and traditional square dancing, international folk dancing, couple dancing, waltzing, English country, Scandinavian, and more. A particular favorite is the contra dance medley, originated at the NEFFA Festival. There are plenty of introductory workshops as well as sessions geared towards intermediate and advanced dancers. Dance Performances: Costumed ethnic performing groups have been a part of NEFFA since the beginning. We pride ourselves on hosting a huge variety of performances on stage from different cultures such as Middle Eastern, Serbian, Bulgarian, Egyptian, Chinese, and Scandinavian, to name a few. Also, about a dozen morris teams dance outside of the High School during the day on Saturday and Sunday — a welcoming sight to new and returning Festival-goers alike. Family Events: NEFFA is a great place to bring your family. There are many family-oriented programs at the Festival, from dancing and singing to storytelling and puppets. Here is more information that families with young children might need. Family Resource and Activities Room: A hands-on room for kids, teens, and adults to enjoy arts, crafts, and puppet play. Food: Vendor booths and food trucks are open throughout the day and have a variety of offerings, including kid-friendly and vegetarian meals. Breakfast foods are available Saturday and Sunday AM. Take a look at our list of vendors to see the diversity of tasty eats. Come hungry! Crafts: Handmade items are for sale in the crafts room from a juried selection of vendors. Many exhibitors demonstrate their work. Folk Bazaar: Vendor booths are located in the middle school hallways and classrooms and offer a wide selection of folk-related wares, from music CDs to jewelry to puppets and more! Vendors hail from a wide variety of folk traditions. Performer Sales Table: Books and recordings by NEFFA performers are for sale, as well as NEFFA souvenirs and T-shirts. Discussion Sessions: Thought-provoking dialogues provide a great opportunity to network with other Festival attendees with similar interests. These moderated discussion sessions cover a wide range of topics. The NEFFA Annual Meeting: NEFFA is an all-volunteer run organization. Come meet the Board, provide feedback, and ask questions. NEFFA works year-round for Festival planning, dance productions, grants and a number of other purposes. There are frequently positions available on the Festival Committee and the NEFFA Board for interested people. Contact Terry Huffaker (President AT neffa DOT org) if you are interested in getting involved. If you are interested in performing on a volunteer basis at the Festival, you can fill out an on-line application. Applications are available here in early September with different deadlines based on performer type; dance demo groups have a few months to apply and other performers have a deadline in early October. Email Program Chair Jon Cannon (jonathan.j.cannon AT gmail DOT com) if you have specific questions. View performer index. The Festival runs as well as it does because of the efforts of hundreds of Festival volunteers. You can earn free admission by volunteering. Check out our volunteering site! The Festival has several areas for people who want to sell their wares. Please contact the appropriate person for that area. Food Court– Contact Food Chair Dayle Watts (deewatt69ATgmailDOTcom). Crafts Room – Items for sale hand-made by seller. See this page for more information. Contact Crafts Chair Ann Schunior ( neffa AT schunior DOT org). Folk Bazaar – Items for sale from folk traditions across the world. Contact Folk Bazaar Chair Len Bittenson (len DOT bittenson AT gmail DOT com) or access the Folk Bazaar Application Form. Access Information: You can find an Access Guide at the Information Table in both the Middle and High School lobbies. The Guide describes access services and includes a Festival map highlighting special routes for people using wheelchairs to travel between rooms. Please contact the Information Table if you need assistance with access to a program or activity. The Access Guide is also available in large print and braille formats. Large print schedule grids are available; be sure to check the wall grids for last-minute changes. NEFFA can provide ASL interpreting at certain events upon advanced application, and there are a limited number of Assistive Listening Devices (ALDs) available at certain events. Requests for use of an ALD or ASL services should be made in writing to the NEFFA office (P.O. Box 2789, Acton, MA 01720) by March 1st. See this page for more access information. Handicap parking is available at the Festival site in front of the High School. Videotaping and Audio Recording: NEFFA policy is to allow video and audio taping for personal use only. Please respect performers’ requests to have recording devices turned off during their session. No animals other than dogs assisting the disabled are allowed on the Festival grounds. Food may be eaten only in the cafeteria or outdoors! It is not permitted in any of the other rooms or the hallways of the Middle or High School. Be aware that vendors who need to be at their booth and Festival staff who must be at certain volunteer posts have been given exemptions from this restriction. Non-glass sealed water bottles, such as sports bottles, are permitted, but must remain sealed when not in use. The New England Folk Festival Association, its agents, servants and employees do not assume any liability for any damage, theft, or other loss to your vehicle or your property that occurs as a result of parking your vehicle in any of the lots that are designated for Festival use. Overnight parking is not permitted in any of the lots used for Festival parking. No smoking, alcohol consumption, or illicit drugs allowed on school grounds. Children must be supervised by a parent or guardian at all times.Events coded “F” are designed for you and your children to participate in together. NEFFA expects all dancers to exercise care and be respectful of others in their dancing. No aerials (lifts) allowed; please keep at least one foot on the floor at all times. The New England Folk Festival Association, its agents, servants and employees do not assume any liability for any injuries that may be sustained due to the condition of the halls or the dancing. Don’t leave valuables unattended at the Festival. For Festival Lost and Found, call 617-299-1590 or fill out an on-line Lost and Found form.